The Montreal artist-run centre TOPO positions itself as a laboratory for digital writings and creations for web, performance, and installation spaces. Created in 1993, and present on the web since 1998, the organization guides, incubates, produces, and circulates original multimedia artworks that explore interdisciplinary and intercultural hybridizations in the digital arts. The most recent high point of this twenty-year cycle is the inauguration of an exhibition showcase, the Vitrine. This digital book provides a record of the first two exhibition seasons (spring 2015 to spring 2017), in which artists and duos explored the possibilities and limitations of this unique space with different kinds of interactive apparatuses and also as a performance site. Here are the questions that guided our artistic direction: Who or what inhabits the Vitrine? How and with what “theatrical effect”? How do we think about notions of interaction and interactivity between the inside and the outside? How can we activate a relationship between the artwork inside the showcase and visitors on the outside, in a hallway? With the Vitrine, TOPO invites the public to a direct, fresh, and constantly changing experience of interactivity with the artwork and the artist. It offers a new cycle of research to reaffirm an interdisciplinary vision of digital arts nourished on aesthetic and conceptual currents from the visual arts, cinema, literature, and performance. 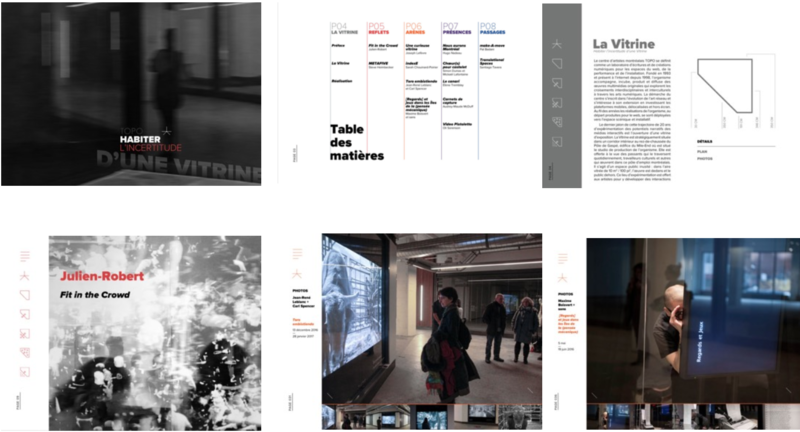 The digital book, designed by Isabelle Gagné, is available free on several platforms in French and English digital versions.